”I thought of Fonny’s touch, of Fonny, in my arms, his breath, his touch, his odor, his weight, that terrible and beautiful presence riding into me and his breath being snarled, as if by a golden thread, deeper and deeper in his throat as he rode--as he rode deeper and deeper not so much into me as into a kingdom which lay just behind his eyes. He worked on wood that way. He worked on stone that way. If I had never seen him work, I might never have known he loved me. Stephen James and Kiki Layne star in the 2018 film that was released on December 25th. Fonny and Tish have known each other nearly their entire lives. Sometimes relationships like this evolve into being friends or at least acquaintances for life. Sometimes they become lovers, and when lightning strikes the same place twice, they become lovers and best friends. This is a tale of two families. Tish’s family is not only supportive of the relationship but go so far as to consider Fonny part of their family. 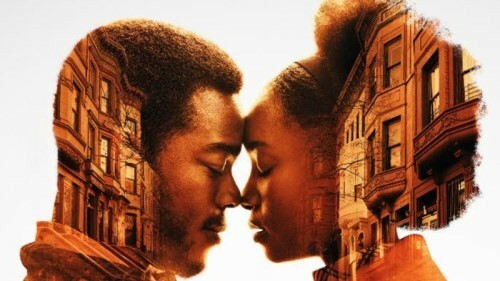 As Tish and Fonny are caught up in the whirlwind of 1970s racist New York, the support of Tish’s family is the only thing standing between Fonny spending a good part of his life in jail and Tish having to work the streets to make enough money to afford a lawyer for his defense. Fonny’s family is a different story. His mother has never thought highly of him or his prospects. She is a religious nut who, in her fervor for her God, has lifted herself up above the rest of humanity. From this perch, she can cast judgments down on those around her, especially those not heeding the call of the church. She would be a better Christian if she were casting bread instead of casting aspersions. Fonny’s two older sisters, taking their cues from their mother, are dismissive of their little brother as well and find it embarrassing, rather than tragic, that he has been arrested. They are sure he is guilty because they have found him guilty his whole life. Fonny’s father is an interesting character. He is a man who loves his family, but he knows that Fonny needs his love more than the rest. Tish’s father, Joseph, is always bucking Frank up, giving him hope. James Baldwin was proclaiming that #blacklivesmatter from the beginning of his existence as a writer. Being a young, virile, prideful, black man in the 1970s was a dangerous thing to be. Fonny, by breathing the same air and walking the same streets as the predominantly white police force, has committed a crime. Yes, he has committed a crime by existing. When he comes to the attention of one particular cop, it is only a matter of time before he is put in the frame for something. This cop has an interest in Fonny that is akin to sexual desire. He pursues him like a spurned lover pursues the person of their affection. He is the head of the hammer of white fear. The problem is that Fonny is at the pinpoint of that blue eye. This is a book about injustice, about family sticking together, about community, and it is about love, real love, soul trembling love. It is the type of love that, when your lover walks in the room, you feel your insides turn to Champagne with frenzied bubbles and a cork in your throat trembling to hold it all in. One thing I’ve learned about life is those that have the least to give, give the most. Two Bards hanging out together. The conversation they would have had over a bottle of wine. 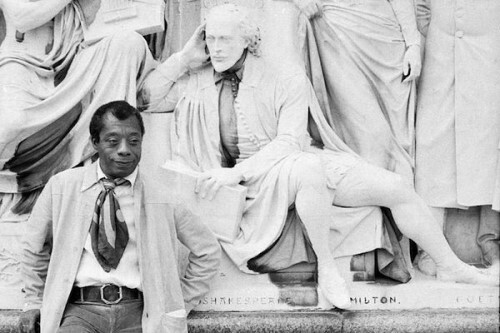 James Baldwin moved to Saint-Paul-de-Vence, France in 1970. This book was published in 1974. Even though he was an American in exile, America came to him. Miles Davis, Josephine Baker, Sidney Poitier, Harry Belafonte, Ray Charles, and many more made pilgrimages to see him. He spent most of his days writing and responding to correspondence from all over the world. He changed lives with his gift of hope and his honesty about what was really happening to Black America. Every time I read one of his books, I am struck by the power of his prose and the passion of his anger. He was determined to drag America, kicking and screaming, under a soul revealing, bright light so the demons of inequality, racism, and hatred have a chance to be exorcised.